Johnson's Baby Lotion Has Been Trusted By Mums For Over 125 Years & Is Perfect For Moisturising & Cleansing Your Baby's Delicate Skin! Clinically Proven To Be Mild & Gentle. For Moisturising & Cleansing Delicate Baby Skin. Trusted By Mums For Over 125 Years. 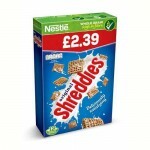 "Johnsons Baby Lotion 200ml + 50% (300ml) x 6"
"Nestle Shreddies 415g p.m. £2.39 x 6"